View of the Lodge from the front. Wonderful location and very comfortable. We thoroughly enjoyed our stay and enjoyed the jacuzzi and sauna. Views and location are superb. It is a very comfortable lodge with a fully equipped kitchen which made it easy to cater for ourselves for the week. There were a few issues including a broken bedside lamp in the double bedroom and a leak in the shower of the twin bedroom. 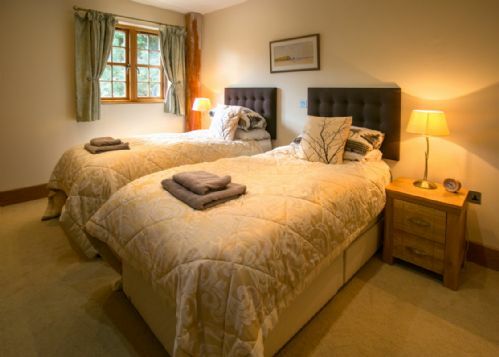 We felt that the bed linen and towels were of disappointing standard for a luxury lodge. However overall we were very happy with the lodge and our stay and would come again. We love it here, we've been 3 times and will be back again. Such a beautiful place inside and out and the scenery is to die for. Waterloo Lodge was a spectacular place on the perfect location, Everything you wanted needed was in he house. views were amazing. would most certainly return for another break. A Magical Christmas at Waterloo Lodge! We have just spent a truly magical week over Christmas at Waterloo Lodge (family of 5 with 3 teenagers). The lodge is so well equipped and had everything we needed to make Christmas special - including cooking dinner! There is lots of space and even with all our luggage, food/drinks and Christmas presents the lodge never looked cluttered which was wonderful for us! The lodge is beautiful and has a feel of luxury and we loved the hot tub and sauna which made us feel well pampered too! 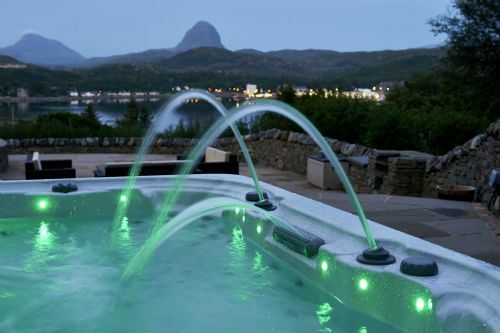 Sitting in the hot tub sipping a glass of fizz looking at the amazing view was fantastic. We arrived after a long journey to find a beautiful Christmas tree and lights all ready so thank you to the owners for that! You really have thought of everything to ensure we had a wonderful holiday. We also loved the area and the view from the lodge is amazing. We went to Ullapool for a day for lunch and also for the Tesco and then after that the Spar in Lochinver was great for everything else and the return journey from Ullapool was the most amazing scenery we have ever seen - such a beautiful part of the world. We went to Alchmelvich beach on Boxing Day which is truly beautiful with white sand and blue water - must be a beautiful place to visit in Summer too. If you like walking then this is a great place for that too. We also visited the Lochinver Larder which was closed over Chrismas but opened on 27th which was just about the right time as we needed a change from Xmas dinner by then and also to sample their famous pies! There are a couple of other restaurants in Lochinver and the Wayfarers bar which were all open.There is some information to read on the book shelf which was really useful too - it was great to read about the history of the Waterloo lodge! My advice if you are thinking of booking would be to book! I fail to see how anyone cannot love this place. All in all we were one very happy family - we were really sad to leave and thank you for such a wonderful Christmas! The Pooler Family. What a fantastic venue for my 60th birthday celebrations! Our family had an absolutely fantastic week at Waterloo Lodge - we all loved it. I really can’t think of a better way to have celebrated my 60th birthday with the family. We knew Lochinver and Baddidarroch well so we knew the location was stunning, but we had never stayed at the Lodge before - what a treat! Waking up to that view across to Suilven each morning was great. We had superb weather, great walks, great food and lots of games in the evening. The lodge exceeded all expectations and we will definitely be back again. Many thanks Kirsty & Jason. 4th holiday at Waterloo Lodge in the last 3 years and as ever it was awesome. Some really nice additions to the property this time - love the cartwheel light fittings they are a work of art. Already looking at booking for next year, love the place. 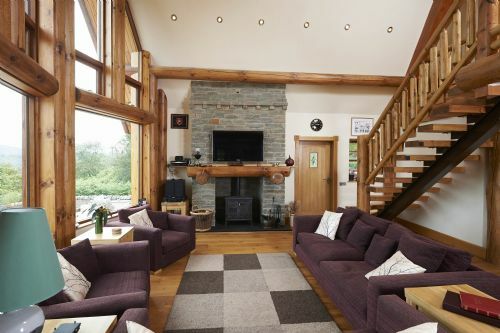 Waterloo Lodge is an extremely well appointed and comfortable house and a great base for a holiday in the Lochinver area. 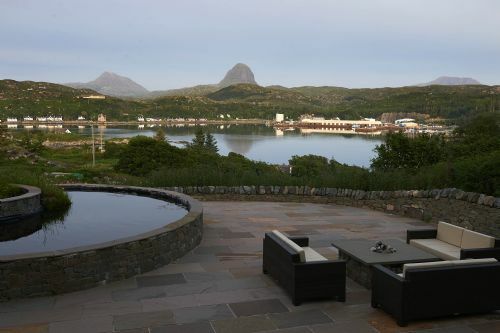 The house sits in a lovely site with fantastic views of Lochinver; Canisp and Suilven. Wir waren jetzt zum 10x in Schottland, aber eine so einzigartige Unterkunft wie die Waterloo Lodge hatten wir noch nie. We enjoyed another very comfortable stay in this excellent accommodation. The view is unbeatable and the space is generous. We stayed to celebrate our wedding anniversary and the lodge was perfect. The place is well equipped and the location spot on. If I had to find a criticism it would be that the bed in the master bedroom is very soft. Would recommend the place very highly for a relaxed and chilled out break in a breath taking scenic location. We had the best time staying here for a week in February 2018 with our little scruffy mutt and were very much ready for a rest after all the wedding fuss. It's about a 20 minute walk into Lochinver village and although a lot was shut at the time of year but we still had a lovely time exploring and buying pies! The gallery is worth a browse and the owner very helpful and chatty - he recommended Oldshoremore for a visit and he was right - stunning! The lodge is extremely well equipped and spacious - it very much feels like a home from home. 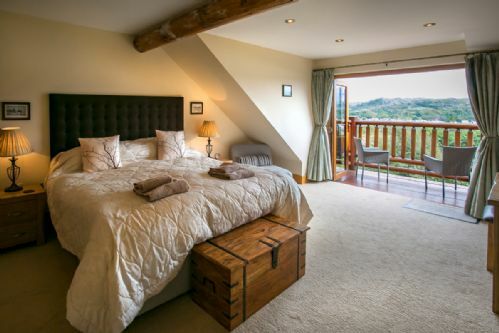 There were only two of us so we only made use of the upstairs bedroom with its lovely views and we had some of the best nights sleep for a long while. We had a lovely time exploring the stunning beaches around the lip of Drumbeg during the mornings, some pottering and binge watching box sets in the afternoon before cheeky fizz in the indulgent hot tub at dusk and then dinner courtesy of Tesco in Ullapool!! The only little bit of feedback would be that some clearer instructions could be useful for the hot tub, sauna and music system - Kirsty was terrific at answering queries by email and we very quickly had the owners Dad come and check we were doing everything right with the hot tub which could have been avoided. Heavenly place and highly recommend staying here. We loved staying at Waterloo Lodge. It is comfortable, very spacious and perfect for our family of 5 (children aged 16, 13 & 11) and 2 dogs. It really was a home from home (only I wish my home was this beautiful and had these views!) 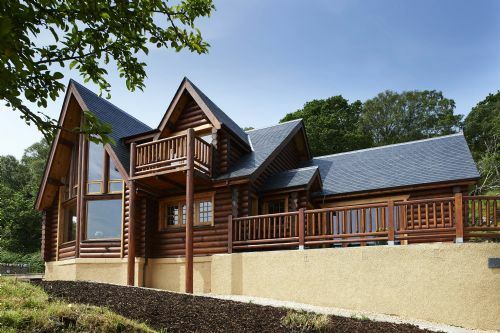 I would definitely recommend this lodge and think it is excellent value for money in comparison to others of a similar standard. The family who own it offered us fantastic service when we contacted them and I will look to book again next time we visit that area. Third wonderful visit to luxury highland lodge. This property never fails to deliver. Fantastic location...luxury appointment and excellent comfort. Hot tub and stars in the Sutherland sky....with a glass of something fizzy - bliss. Some rough edges beginning to appear, but nothing that would stop us making our fourth visit in due course. Thanks to Jason and Kirsty for making our short stay possible and to Roy for looking after us. Really memorable stay with the family. The house is wonderful and is very well equipped. We hope to be back soon ! A repeat visit for us after visiting last year for the first time. Our stay was again lovely! 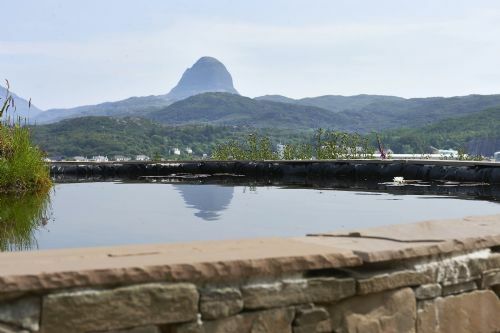 Superb house with great facilities on an elevated position with views across the bay to Lochinver and the mountains beyond. This was our second visit, and although the weather wasn't quite as good, the house was. The house is comfortable and very well equipped with all mod-cons. The sauna wasn't working whilst we were there but that was no issue for us, and we appreciate given the remote location that sourcing contractors and parts to deal with specialist equipment like that can be problematic. Everything else was perfect for us, and it's a lovely place to spend a week with plenty to do even at this time of year. We'd recommend a drive up to Durness (walk along the beach at Balnakeil and an amazing hot chocolate at Cocoa Mountain), the food at both The Caberfeidh and Lochinver Larder is very good, and the walks at Inverkirkaig, Little Assynt, Old Man of Stoer plus the walk fromt he lodge over the hill to Achmelvich. We will be back again in the future given how much we have enjoyed ourselves on each of our visits. Shortcomings let this excellent accommodation down. The steam room is out of commission and has been for some time, why were we not told before the stay. 5 stars are hard to maintain & despite being an excellent property there are too many things letting it down. Spacious and well equipped luxurious lodge in a stunning location. All you need for a truly relaxing holiday. 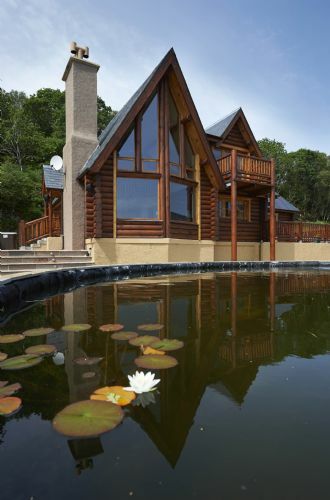 Wow, lovely lodge in a stunning location, very special indeed ! Lovely lodge in stunning location, hot tub was lovely as was the steam room once it was up and running. Thankyou to Roy and Kirsty for all their support in making our stay a memorable one. Everyone was so friendly and helpful during our stay. The Pie shop is worth a visit and not far from the lodge. There are lots of wonderful walks in the area and we were privileged to see plenty of deer and an otter in Lochinver and a seal when we visited Durness beach. Would love to revisit this special place in the future. 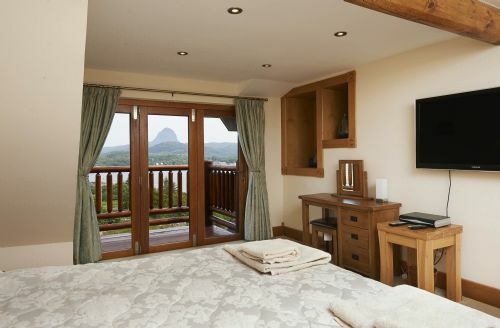 Excellent quality Lodge located in spectacular surroundings. This Lodge provides everything for a relaxing and extremely comfortable break. All of the facilities are excellent quality and there is nothing that you could possibly need that is not available during your stay. The views are breathtaking, particularly from the hot tub! The Lodge is close to the main village, so easy access to local restaurants and shops. But it also provides the perfect base from which to explore local walks and scenery, as well as excellent fishing. A very comfortable property which provides a relaxing environment for much needed peace and tranquility. Thank you for such a wonderful stay in your amazing lodge. The views were second to none-totally breath taking. The lodge was clean and well equipt, and lochinver itself was a fantastic place to stay. Thank you! Second visit, the place gets more amazing. This is our second visit to Waterloo Lodge, great accommodation, lovely area, nearby beaches fab, enough places to eat out, very well equipped, hot tub amazing, fantastic views and a lovely family who run it. Not a negative thing to say. We have 3 kids under 7 and loved it as a family break! Overall a stunning property and stunning location, both property and view 5 star. 1. No gas for the outside fire pit, I found the bottle and it was empty, where there are so many midges in the evening I felt the fire would have been an important feature that may have reduced this and provided a bit of warm in the cooler evenings. 2. The pond, honestly looks a little green & lost, where are the beautiful fish in the promotional VT? My son was so looking forward to seeing them, perhaps find another way to enjoy this feature. There appears like there could be lights & water feature but we couldn't find how to switch these on. Overall great property and lovely surroundings. We had a lovely week at Waterloo Lodge. The views are stunning. The House is comfortable, with everything you need. There were only two of us so we "rattled" around a bit. Never really got the hang of the hot tub and didn't find the instructions very helpful. The steam room was good and easy to work out. There were one or two problems which is why the condition was not given an excellent rating. A leak developed from the main bedroom shower which came down in to the bedroom wardrobe below. This was just discovered on the day before we left so there was no time to put it right. There was a foisty unpleasant smell in the en-suite in the same room. If these can be sorted the rest of the property would have an excellent condition review. Lochinver has some very good eating places Lochinver Larder for a huge selection of Pie's, Peet's is very good but our favourite was the Kylescu Hotel, a short drive away. We like walking and there are a lot of good walks in the area. 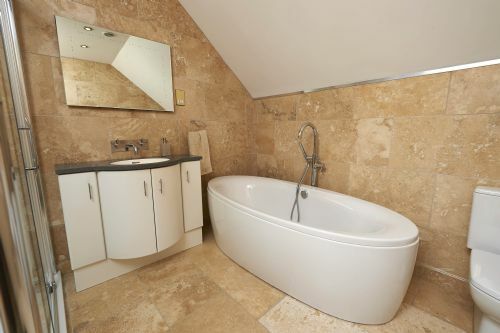 Waterloo House is a luxurious and spacious property in a superb location. We had a lovely holiday with friends. What a beautiful property in a lovely setting. We had a fantastic time in Lochinver - stunning scenery and the lodge was just as lovely as the website pictures. I think it would be difficult to find a nicer property in the area to stay in. The lodge was perfect, modern and had everything we needed to be comfortable for a week stay. It even had a telescope for you to take in the sights. The massive kitchen was well equiped, even having 2 freezers. 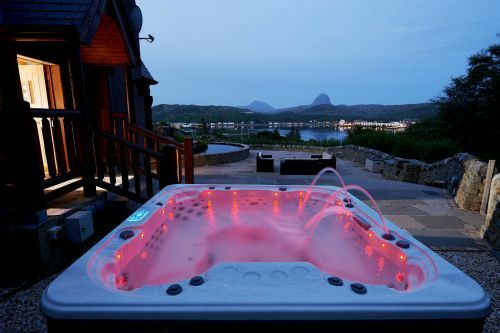 The hot tub and steam room was a fab added bonus with great views over Lochinver. The large garden (not fully enclosed) was spacious, had a lively seating and fire pit area with the use of a built in bbq. Lodge was warm and cosy, we would definitely recommend and return in future. This was our second trip to Waterloo lodge and once more was an amazing stay. 5 star luxury and excellent customer service. Can't wait to come back again! 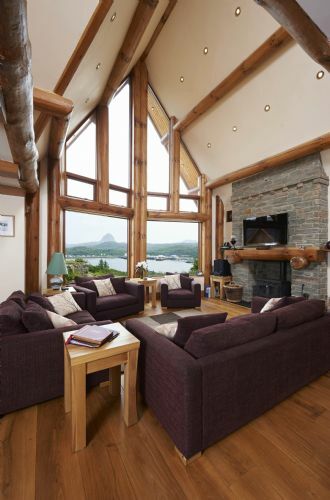 A lovely house to stay in with spectacular views over the bay to Lochinver. The house is very large and would comfortably sleep six + people. Very well kept and clean and tidy. We'd definitely come back to stay. A 10 - 15 minute walk down to the local pub, or Lochinver Larder, with the Spar shop another few minutes along the road. Loads of walks that can be done from the house without the use of a car (Achmelvich, up the River Inver, or the Culag Woods). The sunrise over the bay everyday was pretty awesome, and nice to enjoy with a coffee on the patio (even in the cold!). I had a week here in mid July with my young family. Everyone loved the house and the setting. The beds were comfortable, there are tons of loos and bathrooms, the kitchen is enormous and well equipped. The hot tub worked absolutely perfectly and was a massive bonus in the frequent bad weather. Most of all the views were stupendous. This place isn't cheap but for what you get I think it offers good value for money and would thoroughly recommend it. Apart from a great location some issues require to be addressed before this property can be marketed as it once was. No doubt it could be great. That's it . A wonderful week away in Lochinver :) Lodge was beautiful open space. Very clean & tidy. Hot tub was great fun & we used the bbq area as the weather was hot. Great location for the bay and a walk into the town. Jason, Kirsty, Sue & Roy were friendly and offered great advice for areas to visit and places to eat. They were also prompt to reply to queries before & during our stay. Pretty darn close to perfect. Had an amazing week in this fabulous house. Celebrated a 50th birthday with family here and it made it extra special, thank you. Well equipped kitchen for self catering but plenty choice if eating out, we particularly enjoyed the Caberfeidh. The accommodation is a very high standard and very very comfortable. Beautiful area to visit amazing walks and breathtaking beaches, perfect to come back and relax in the steam room or hot tub and enjoy the views. Cannot recommend highly enough, really hope to get the chance to return. Our second stay at Waterloo Lodge lived up to the expectation set by our first visit a year ago. The property is truly luxurious, well equipped and maintained to a very high standard. The views were spectacular as ever, reflecting the prevailing weather conditions which varied from cloudless blue skies (true!) to scudding low cloud and rain. Used the stove in the main living space for the first time - easy to light and when fully loaded and damped down required very little effort to keep going. Well impressed! A glorious and comfortable week watching sunsets from the hot tub. Loads of lovely walks around and about and we spotted a range of wildlife as well as the aurora! The pie shop close by is well worth a visit (or two) as well. The week went very quickly and we were all very relaxed on our return to reality. Spent 3 nights here in early Feb with family. Superb house, even in a Scottish February. Loads of space. 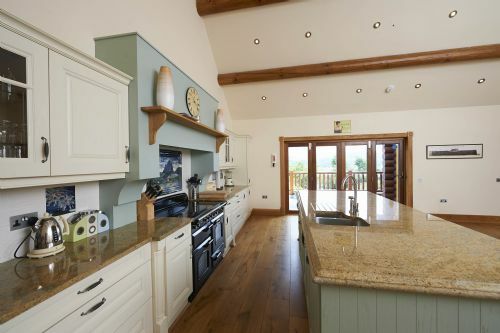 Fantastic spacious kitchen. Kids even got to use the hot tub. Would love to use it in the summer , but works out a bit expensive for 2 !!!. 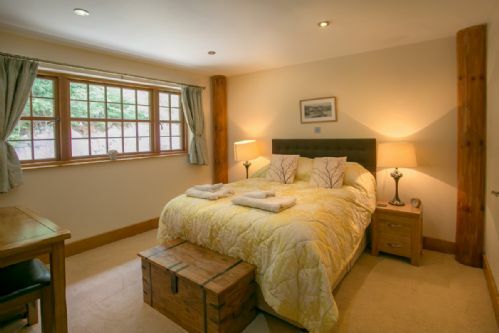 Waterloo Lodge is a fab house for a relaxing stay. My mum, sister and I went for 3 nights. It is in the most amazing location, stunning scenery. 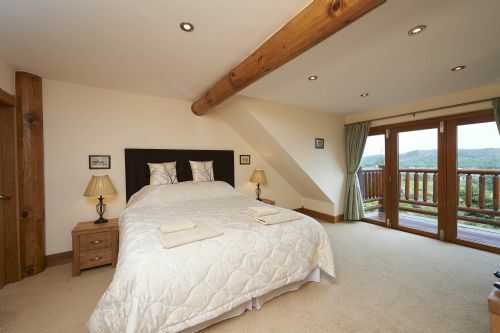 The Lodge is georgeous so spacious, really comfy beds, great to have en-suites in all bedrooms. The hot tub and steam room are brilliant, we didnt leave the house at all just enjoyed relaxing, and we weren't disturbed at all. Correspondance in booking was really good, very easy and helpful. The only minor issues we had were the drains were quite smelly especially in the double bedroom bathroom, but that could be because it hadn't been used in a while, so we left the shower on for a bit which made the smell mostly disappear. Also the dishwasher hadn't been emptied and had dishes left in and some of the dishes in the cupboard had bits of food on them. But these were all things we could deal with ourselves, and didn't detract from the amazing time we had at Waterloo Lodge. We thoroughly enjoyed our New Year week at Waterloo Lodge. 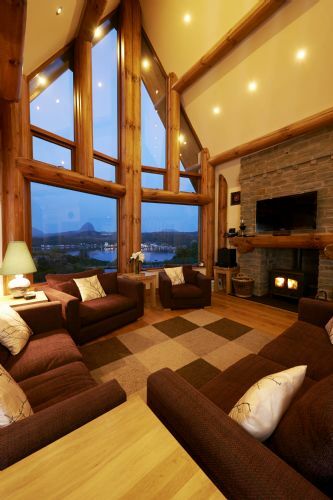 The house is in a beautiful situation with a stunning view across Lochinver to the Sutherland hills. Having the outdoor hot tub was enormous fun and it was great to have it clean and ready to go for our arrival. 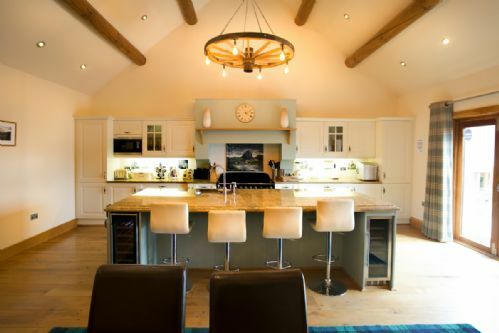 The kitchen is a lovely space, beautifully designed and a pleasure to enjoy cooking in. We had a minor hitch with the washing machine door during our stay and the owner's parents who live nearby could not have been more helpful or accommodating which we really appreciated. We would definietly return to Waterloo Lodge again and would certainly recommend it to others. Enjoyed our stay, we have a disabled 21 year old daughter, so the area of lochinver is challenging but we knew that. We have loved staying in Waterloo Lodge, the house is everything it says it is, everything we hoped for and more. Fantastic place, lovely people who couldn't help us enough. Can't wait to go back. The steam room was an added bonus on top of everything else. A fantastic holiday in an amazing property in a stunning location! This house is fantastic. Finished and furnished to an amazing standard in an absolutely stunning location. We couldn't have asked for more. We were looking for as close to a villa holiday as we could find in Scotland and Waterloo Lodge ticks every box. beautiful house, basins in en-suites not ideal as far to small to wash face or brush teeth, on arrival discovered note to say hot tub was out of order, we were extremely disappointed as it was one of the main reasons we booked waterloo lodge. When I returned home I discovered an e-mail informing me about hot tub which was sent the day after we arrived at waterloo lodge. The lodge has pretty much everything you need - we spent a lovely relaxing week here! 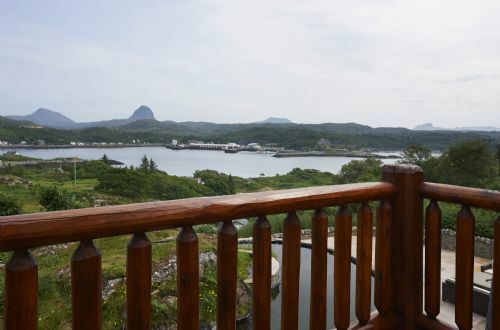 The area itself is beautiful, and the lodge is close to plenty of restaurants in Lochinver, which was just a few minutes away. Lochinver Luxury for 50th Birthday! 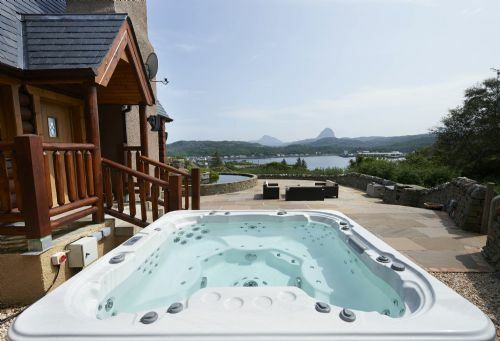 Good location, views excellent, easy for access into Lochinver and its amenities, and in general very well appointed, and both steam room and hot tub were a lenjoyed by all. Would have liked to know in advance how close Waterloo House was to the Lodge, as I like to feel private, and it was a bit closer than I was comfortable with to use the outside music speakers whilist in the hot tub without worrying that the neighbours may be disturbed, and felt that this was not visible on the website. However the aspect of both houses did not impact on the views over the loch and on to Sullivan and mountain views. Info leaflets and some basic instructions in one location for all appliances would be helpful for technophobes such as myself. A lack of a few small things in the kitchen which otherwise was very well equiped - bottle opener, medium sized casserole dishes spring to mind, but loved the Highland stoneware crockery, and very helpful of have plastic glasses for the hot tub. No notes as to how to operate the outside fire, and no gas in the bottle or if we could replace it, so were not able to enjoy sitting on the patio area in the evenings as the scottish weather was not that kind. Everything was excellent,if I had a criticism it was there was no room for drying wet clothes after being out on the hills.The hot tub was lovely after a long walk. One of the best holidays ever! The location is perfect and the view from the living room is a dream! I hope for the future to come back again . I love the Lodge and place. Thanks again. The lodge was exquisite, no other words could describe it. Location was brilliant, we did loads of walking and sea kayaking. It was great for the dogs. - temp setting was far too high, was set at 24c when we arrived and it was uncomfortably warm for the people and dogs (but easily adjusted at thermostat). - 6 car spaces are shared with the other house, so when they had a party we struggled to park our two cars. Needs to be correctly advertised on website. Brilliant property in the magical location with amazing views of the bay and mountains beyond. The lodge has everything you'd need to relax and unwind. The kitchen is fully equipped and the steam room and hot tub were popular with my party. Locally there are beautiful beaches, plenty of walking opportunities or cycling routes. Stunning property and stunning view. We absolutely loved our time in Lochinver and would not hesitate in coming back. We were looking for a chilled out base to plan daytime activities with a luxurious home to enjoy at night time - the accommodation and surrounding area did exactly what we were looking for. I would recommend to everyone. The weather wasn't great but it didn't matter, the lodge was so comfortable, cosy and very homely. I live in an area with fantastic views but the ones from the lodge are breath taking. There's plenty to keep you entertained, between the hot tub, steam room and the sky television. Internet access was very handy. Jason was very quick to help with any questions we had. If I could stay every weekend I would. We all LOVED it!!! Perfect setting, perfect accommodation, quite simply perfect. The only place I have ever been that I could return to again and again. A special place. My husband and I stayed in Waterloo lodge in Lochinver for 5 nights in January. When we arrived, we were pleasantly surprised to find a beautiful fire and been lit for us, which after a long drive was a very welcome sight. The lodge itself was decorated and maintained to the highest standard. Beds were extremely comfortable - great nights sleep. All modern conveniences, including smart TV's in each room, and a strong wi-fi connection. We particularly enjoyed the views from the outdoor hot tub and thawing out from our day's hiking in the steam room. Overall I would highly recommend the lodge, and will definitely be returning. Such a beautiful lodge, very comfortable and relaxing. The area is stunning and the locals were very welcoming. Nothing was too much trouble. We felt very well looked after. Will absolutely be returning. The property is great, has everything you need to make sure stay more luxurious. My family and i had a wonderful week at the Lodge.Fabulous lodge in spectacular surroundings.Would definitely recommend this lodge for a peaceful holiday. Great holiday and location - weather not great but it didn't spoil our holiday. Loved the property, our only criticism was that it was quite cold, the heating didn't seem to work very well. Other than that everything was great! 4 of us and a labrador have had a wonderful week in Lochinver. 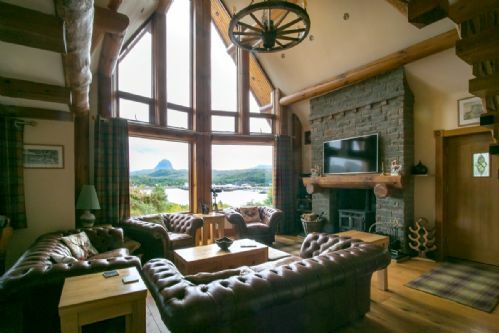 The lodge is stunning; comfortable, has excellent facilities and views of the Sutherland mountains to take your breath away. we also had great weather - a real bonus and to top it off, a Michelin starred restaurant within walking distance. we enjoyed the hot tub and the steam room - a great way to sort those tired muscles after a day's fishing and walking. I have 'self catered ' most of my holiday trips and this has to be the best ever. However it was also the most expensive but worth it. What a place to stay! 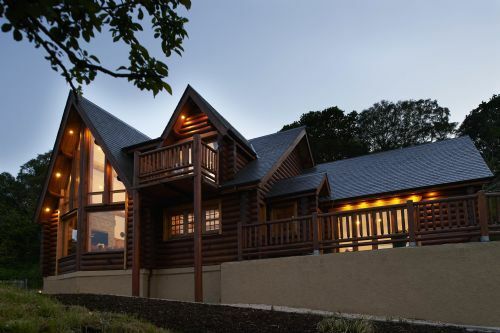 The lodge is large and well fitted out with all kinds of luxurious extras. The views from the lounge (and hot tub!) are breathtaking. We had the added bonus of good weather so we didn't use all the facilities but there is more than enough to keep everyone happy even if the weather is bad. We were particularly impressed with the quality and quantity of what is provided in the house so you are never short of knives or plates. The beds are also very comfortable (no sore backs). The lodge isn't cheap but the quality means you get good value. You also get one of the best views you'll find anywhere. It's ideal for anyone looking for somewhere special to stay in a beautiful location. We had a fantastic stay, the property is beautiful, spacious, modern and well equipped. The location is great and the facilities like the hottub fab! 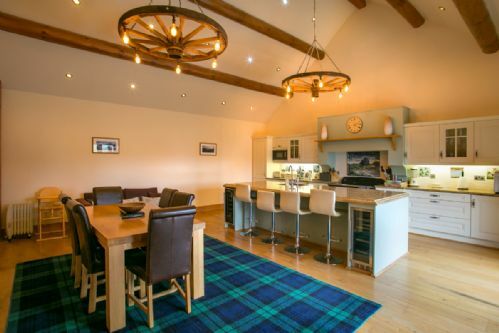 If you're looking for a 5 star, high spec holiday let then this is the house for you. The space, location and outlook are fantastic, and the hot tub is a great added luxury. The kitchen is a great social area and the living room is very comfortable ,especially with the log fire on. All beds were very comfortable and we loved the modern large shower in the master en suite . Great memories made, hope to get back soon. Waterloo Lodge was an inspired choice. Amazing location, fully equipped and very comfortable and luxurious. Incredible views and good local amenities and services. Excellent and we will be returning. Amazing. Could not recommend highly enough. My Husband and I have just returned from our Honeymoon at Waterloo Lodge and can honestly say we have never stayed in such luxurious, well equipped lodge (my husband was especially taken with the 3D TV). The weather was not the best and in typical Scottish style we had all the seasons in one day but I could think of nowhere better to watch the changeable conditions than on the huge comfy sofa in front of the log fire. Will definitely book again (maybe for our 1st anniversary). 3 of us went to waterloo lodge, myself and my husband and my mum. we had also invited other friends / family but unfortunately they couldn't make it. we had a fantastic time there. the lodge is lovely, 3 all en suite rooms, very comfy beds, the master bedroom is great, very spacious with a walk out balcony. the lounge has plenty of large comfy sofas/chairs and a log/coal fire (plenty logs supplied for the week). the kitchen was exceptionally well equipped also. the master bedroom, lounge & kitchen/dining room all have great views over the sea loch to lochinver village and the mountains. we went in feb, and were fairly lucky with the weather, had a fair bit of sunshine and even when it rained we got some lovely rainbows! we even saw the northern lights one night! the hot tub was a highlight for us and we spent hours in it over the week! its a long but scenic drive from glasgow (about 6 hours) and i would recommend breaking the journey (we stopped overnight in inverness on the way up). we would highly recommend, and would love to visit again sometime. if you stay be sure to do the "drumbeg loop" drive (north coastal road) and make a trip up to durness, which is a lovely drive and with some beautiful beaches. Twice a year for the last ten years at various large houses, cottages, lodges and hotels. Our group recently stayed here for a couple of nights. We were blown away with the beauty of the area and the lodge. 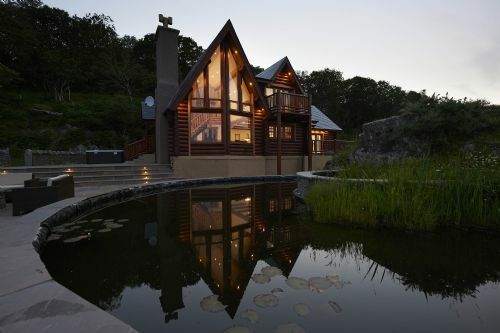 The lodge is beautiful in the pictures and just as spectacular in person. We had a very small issue with the showers being cold but it was sorted quickly. Very pleased with our stay and look forward to staying again.